Take the chops out of the fridge at least half an hour before you want to eat so that they can reach room temperature. Place them in a dish with the lemon juice, oil, chilli, marjoram, salt and pepper and set aside. Rinse the spelt in cold water and make the stock. Cover the spelt with the boiling stock and cook until the grains are just tender (about 20 minutes). While waiting for the grains to soften, cook the sliced onions in hot oil until browned. 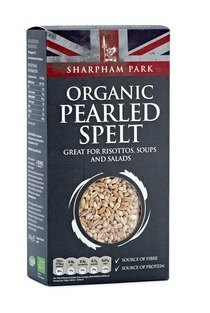 Once the spelt is ready, add the olive oil, citrus juices and season with salt & pepper. Leave aside for 5 minutes before adding in the remaining ingredients and serving. When you are ready to eat, heat a large, heavy frying pan or a griddle pan until it is smoking hot and season the steaks generously with salt and pepper on both sides. Add a knob of butter and a splash of olive oil to the pan and cook the steaks for a 4-5 minutes a side (depending on their thickness and how you like them cooked) and then leave to rest in a warm place for ten minutes. 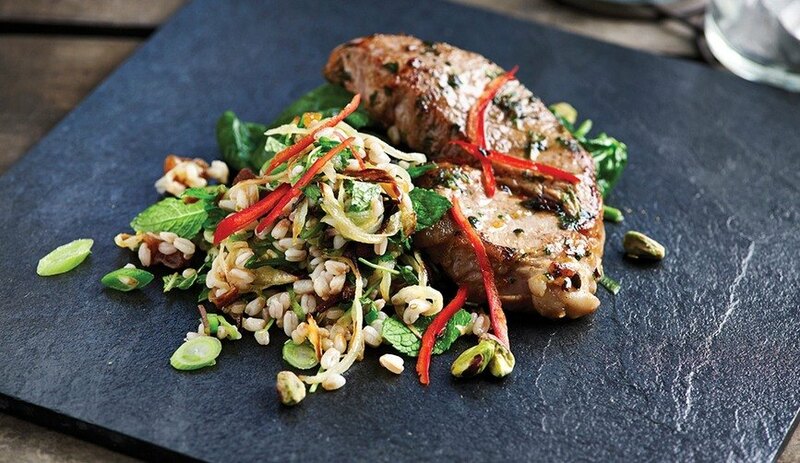 Serve the steaks alongside the spelt salad. For extra vitamins and minerals add some wilted spinach or kale.